SANDVIK TPS will present its turnkey solutions for the processing of composite materials and nonwovens at IDEA 16 (Booth #757). The company produces modular systems combining precision scattering systems, double belt press technology and associated up- and downstream equipment. This multi-stage capability – incorporating feed, heating, reaction, pressing, cooling and tempering in a continuous line – delivers a high productivity processing solution for nonwovens, technical textiles, synthetic and natural fibre based composites. SANDVIK TPS is a world-leading producer of double belt press systems. 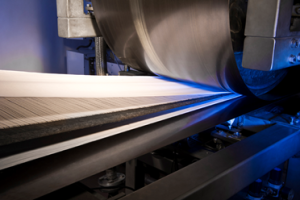 Its ThermoPress ranges include systems that make use of steel or Teflon belts®, and an innovative hybrid press that combines both technologies. Steel belts are used in the forming section where their strength and thermal properties are essential; elsewhere, non-stick PTFE belts are used, reducing overall investment costs. The company is also a market leader in the supply of precision scattering solutions, designing and manufacturing efficient, reliable and economical systems for powders, granules, fibres and other materials. As well as being used for nonwovens and engineered fabrics, Sandvik TPS scattering systems are also used to produce floorings, automotive products, construction materials and more. A comprehensive range of up- and downstream equipment – including unwinding/winding systems, in-line cutters, stacking units and conveyor lines – enables Sandvik TPS to deliver complete turnkey process systems.